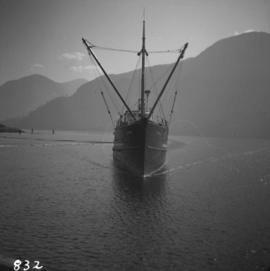 Photograph depicts a ship named "M.V. 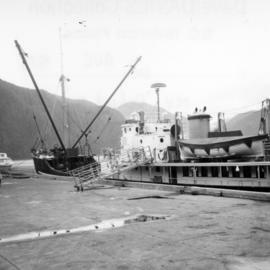 Uchuck III" approaching the Gold River wharf on the west coast of Vancouver Island. 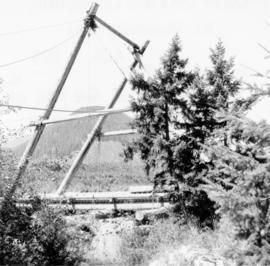 Photograph taken north of Gold River, at the Tahsis Ltd. Tree Farm, on a logging road that led to Port McNiel. Crossing the Muchalat River. The bridge was disused and blocked off. 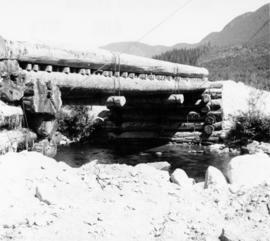 Photograph depicts a public logging road that crossed over the Muchalat River. 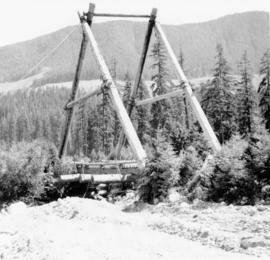 The bridge was disused and blocked off. Photograph taken at the Tahsis Tree Farm Ltd.